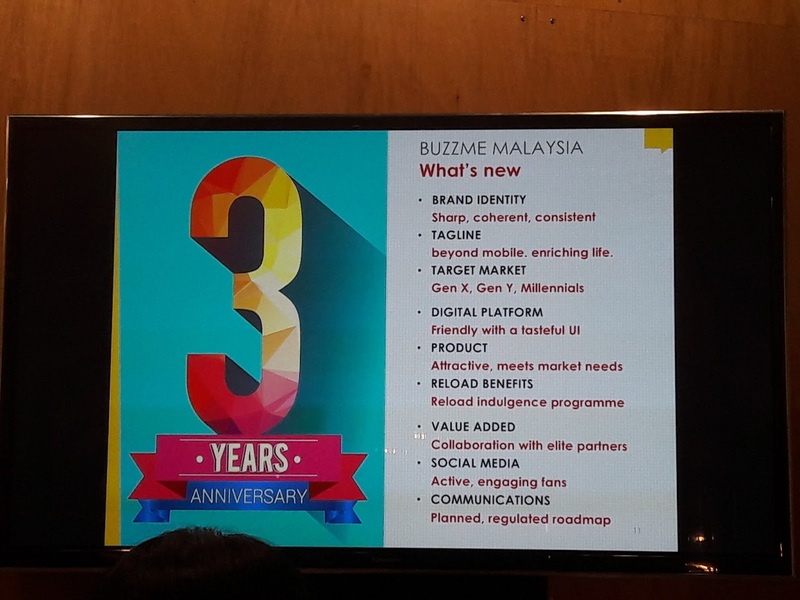 As Buzzme celebrates it's 3rd Anniversary, Buzzme announced exciting new reward plans and promotions to target younger users. With a vibrant new logo, a new tagline and an updated website, theteam from mobile prepaid telco Buzzme announced the brand’s revamped new look as well as shared big expansion plans on Malaysia’s MVNO (Mobile Virtual Network Operator) market and beyond. Held at hip coffee café Bean Brothers located in Sunway Damansara, the brand re-launch event was held in conjunction with Buzzme’s 3 rd anniversary celebration, and included in attendance members of the media, brand partners, social and business influencers, and guests. Spearheading the team were Mr. Loke Yee Siong (Buzzme's Chief Executive Officer), Mr. Kewell Yap (Buzzme's Chief Business Controller), and Mr. Andrew Kok (Buzzme's Head of Consumer Marketing), who via a sharing session revealed Buzzme’s comprehensive update and refresh exercise including user plans, reward programmes and brand expansion objectives so as to rejuvenate the entire business portfolio. As an in-house brand of MVNA (Mobile Virtual Network Aggregator) pioneer in Malaysia and ASEAN, Enabling Asia Tech Sdn Bhd (known for partnering U Mobile), these updates come at a time when Buzzme is re-identifying its core values and position in the telco market that is increasingly competitive. 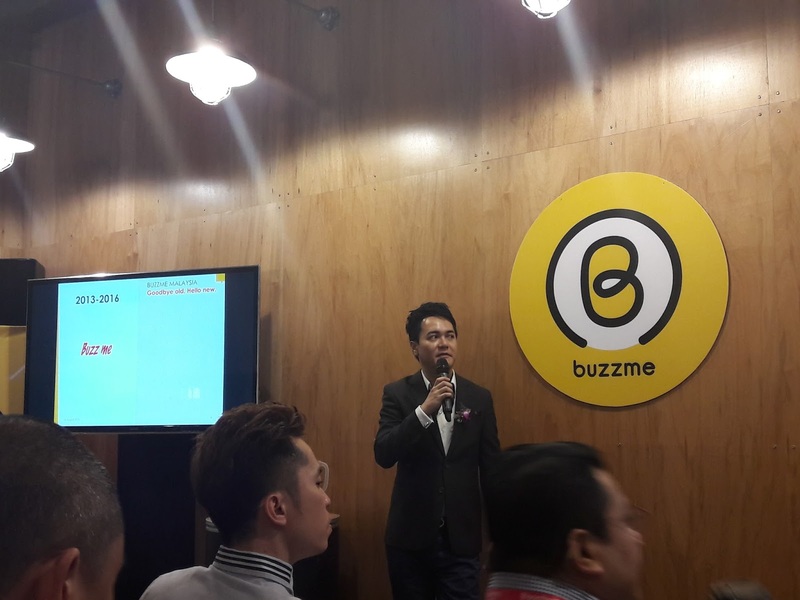 In order to stay relevant in the telecommunication industry, the team at Buzzme acknowledge the need for better products, plans, promos and rewards, and researched into both the Malaysian and regional MVNO market in ASEAN. Mr. Loke Yee Siong, CEO of Enabling Asia Sdn. Bhd. & Buzzme giving addressing the crowd and giving his opening remarks. Mr. Kewell Yap explaining the new Buzzme logo and tagline: "Beyond mobile, enriching life". The redesigned website exemplifies Buzzme’s new identity, with vibrant colors, a clean layout, and a focus on customer friendliness. Re-launched in June 2016, www.buzzme.com.my is key to Buzzme’s new marketing and distribution strategy of shifting the focus from traditional channels to a digital one, allowing its smaller team to extensively reach a segmented audience in an effective and efficient manner. Buzzme prides itself for providing customers with a rewarding experience. For example, Buzzme is the first in Malaysia to provide 20% credit back whenever a customer consumes data, voice and SMS traffic at a pay-per- use rate. This credit is given in the form of reward points, which can then be used to redeem airtime credit or discounts from the m8 online store at www.m8.com.my. Buzzme’s Reward Indulgence programme rewards its customers with five benefits whenever they reload. Customers will enjoy free 500MB data, double credit during their birthday month and free Personal Accident Insurance coverage in the following month with a minimum reload of RM30. Customers who reload online will also receive free 30% extra credit. Finally, customers will stand a chance to win BuzzStyle prizes if they reload RM100 or above. 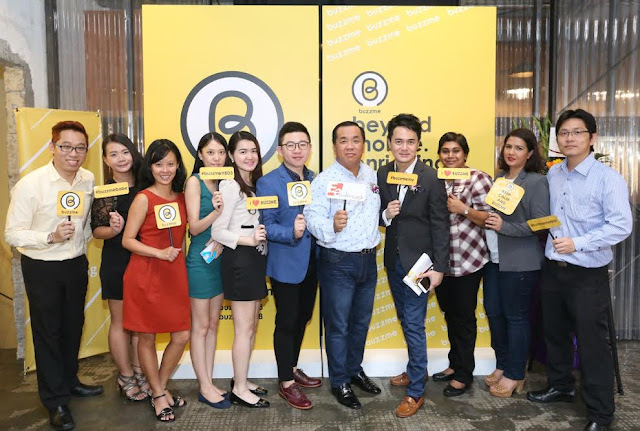 With its new look and innovative marketing strategy, Buzzme is hopeful that it will capture its target audience: Gen X, Gen Y and Millennials. “With our value-for-money plans and lifestyle rewards, we’re positioned as a great deal for lifestyle-savvy, always connected youths. Youths are also more open towards online shopping, providing another avenue for us to connect with our target market. 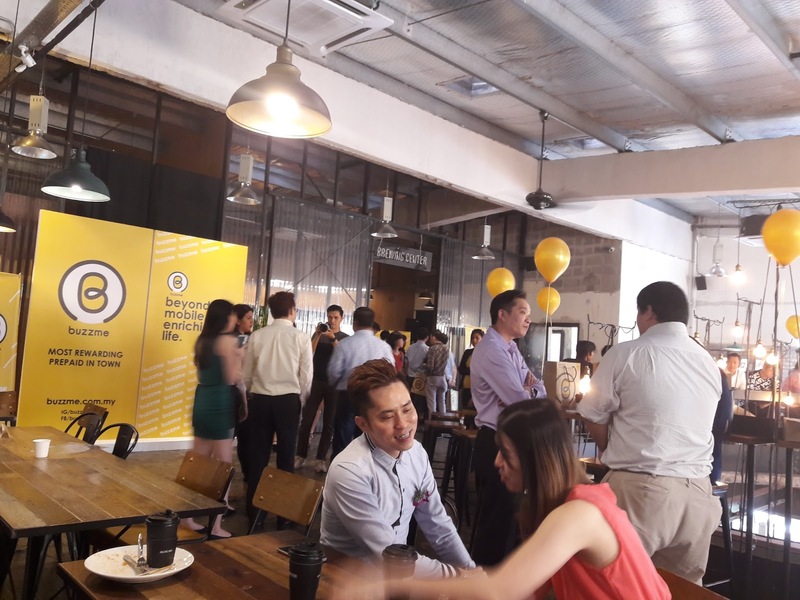 We have partnered with a number of up-and-coming entrepreneurs and brands, providing our customers with unique rewards that can be found nowhere else.” said Loke. 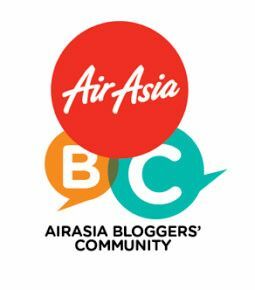 Among the reward plans users can look forward to is the BuzzStyle campaign, whereby with a minimum reload of RM 100, Buzzme subscribers will stand a chance to win prizes from one of the nine Buzzme Elite Partners including Ambersze London (Ladies Fashion), Breakout Malaysia (Escape Game), Centro Hair Salon (Hair Salon), Eranthe L Iconique (Makeup & Styling), JC Group (Insurance), Lancelot Tea Guild (F&B), La Pétales (Beauty & Spa), Sandisk (Memory Solution) and ZTE Malaysia (Mobile Device). In addition, Buzzme are also currently running a weekly Share & Win contest on Facebook with attractive prizes to be won. Not satisfied with being a player on the local market, Enabling Asia and Buzzme embarked on a journey of regional expansion in Quarter 2 of 2016. Current expansion plans will cover five countries – Malaysia, Thailand, Indonesia, and in 2017, the Philippines and Myanmar. These five countries, with a population of 500 million, make up 80% of ASEAN and have an estimated 130 million internet users. As part of this regional expansion, Enabling Asia will be introducing the regionalized product, 1 World, 1 Simcard. Once rolled out across all MVNOs, Buzzme subscribers will be able to use and purchase prepaid add-ons at the country they are in at local rates without having to purchase and swap to a local simcard upon arrival. Instead, Buzzme subscribers traveling abroad will automatically be assigned a local number, allowing them to stay connected with friends and families residing abroad or back home without worrying about exorbitant roaming charges. 1 World, 1 Simcard will definitely bring Buzzme to a greater level and one step closer to become the World’s Local Mobile Provider. By going international, Buzzme aspires to build up the brand’s equity alongside its common reload currency, m8. 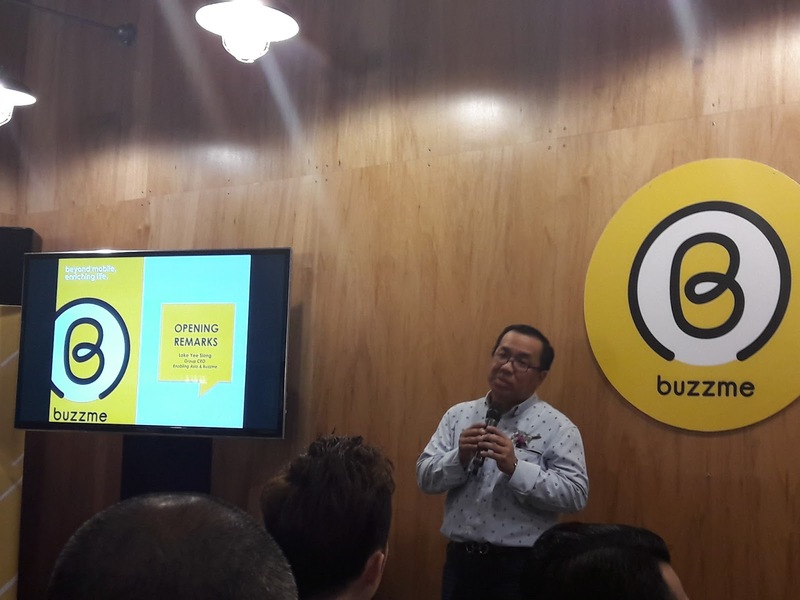 The end goal is for Buzzme to become South East Asia’s first regional MVNO. With the materialization of its expansion plan, customers can soon expect to see the familiar brand of Buzzme overseas, as well as top-up via m8 reloads at any 7-Eleven stores or E-pay touch points whenever a customer is on-the-go. In the near future, Buzzme will be looking to provide even faster mobile Internet speeds as it launches its 4G LTE service later this year. A new hybrid prepaid service that is on par with offers by other major telecommunication providers is also in the works. Buzzme also took the opportunity to thank its partners, dealers, attendees and the media. “The success of Buzzme’s relaunch is thanks to the support of all our stakeholders. We look forward to further collaborations as we continue to grow the brand into Malaysia’s largest MVNO,” said Loke. The anniversary party ended with a bang with a blowout of birthday candles and 3 lucky winners walking away with brand new ZTE phones. While the MVNO market continues to see competition where even the larger telco networks continue to face challenges, Buzzme as a new player sees opportunity to provide its products and services as an exciting and viable option to consumers. Besides ongoing improvement to its network solutions, Buzzme will continue to leverage on its position as an MVNO to offer affordable prepaid services, unique rewards and subscription plans with unlimited validity, proving Buzzme to be the better, smarter choice for mobile prepaid. “Buzzme has never intended to counter the competition in the industry, but we are always committed to delivering products and services on par with market expectations, if not better. We want to set out own goals while considering that the limits to grow are on us, and not others,” said Loke. All attendees at the event received Buzzme prepaid starterpacks, which are now available for purchase online as well as at a number of mobile-telco stores all over the country and are priced at RM 10 and RM 30. For more information on Buzzme, surf over to www.buzzme.com.my, contact the Hello Centre at 011 3400 4400 or email hello@buzzme.com.my. Follow latest updates, contests and promotions and engage with the brand via social media at facebook.com/Buzzme.m8 and @buzzme.m8 on Instagram. 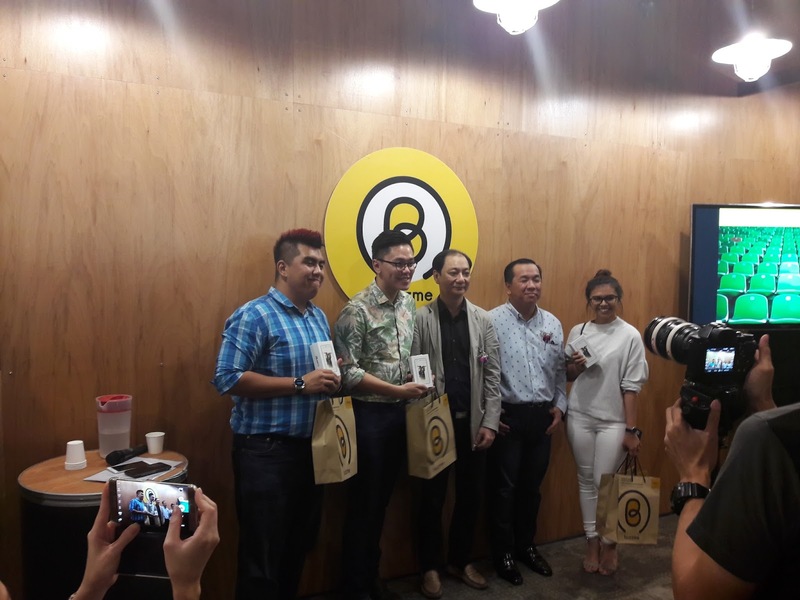 Buzzme, an in-house Mobile Virtual Network Operator (MVNO) brand of Enabling Asia Tech Sdn Bhd, is a telecommunication service provider that aims to deliver the most innovative prepaid mobile services in Malaysia. 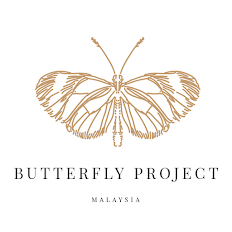 Established in 2013 under Mobile 8 Telco Sdn Bhd, a wholly owned subsidiary of Enabling Asia, Buzzme prides itself for delivering affordable prepaid mobile services with attractive plans and rewards. The management of Enabling Asia and Buzzme is led by co-founder and CEO, Mr. Loke Yee Siong. Enabling Asia is a pioneer Mobile Virtual Network Aggregator (MVNA) in Malaysia and ASEAN, partnering with U Mobile for wholesale traffic and Sisteer from France for platform services. As such, Buzzme rides on U Mobile’s network, providing customers with the strongest, fastest mobile network service nationwide. Since its launch in 2013, Buzzme has seen a continuous growth in user base and revenue. Despite stiff market competition and the softening of economic conditions, Buzzme is humbly able to declare that its entity surpassed the breakeven point at the end of 2015 after 30 months of operations. With the cost excellence programme implemented at the start of 2016, Buzzme was able to maintain its monthly traffic gross margin at the range of 60%. Buzzme is a boutique firm, driven by a young and passionate team with a mindset that encourages thinking-out-of-box and always striving to do things differently. The team at Buzzme is cost savvy and has high sensitivity towards all expenditures, as the entity is considered to still be in its start-up phase, with cash flow and working capital management still the top priority of the organization. Via m8.com.my, Enabling Asia’s online store, customers are able to purchase Starterpacks, reloads, mobile devices and accessories. The website also provides a platform for rewards and account self-management, and is available to all MVNOs launched under Enabling Asia, providing a well-established platform for them to reach a wider market in a cost savvy approach. To synergize the sales and distributions landscape, all customers for MVNOs enabled under Enabling Asia will be able to top-up their prepaid wallet via m8, a common reload currency. m8 reloads are available nationwide at over 1,800 7-Eleven stores and 22,000 E-pay touch points. Buzzme’s Smarter Bundle is the first prepaid plan in Malaysia to give customers an all-rounded, value-for-money package with data, calls and SMS. Smarter Bundle is available in two competitively-priced options, i.e. Smarter Bundle 25 with 1.5GB data (extra 500MB*) + 30 voice minutes + 30 SMS at RM25, and Smarter Bundle 50 with 4GB data (extra 1.5GB*) + 60 voice minutes + 30 SMS at RM50. Both bundles come with unlimited validity, meaning subscribers will keep their data, voice minutes and SMS as long as they maintain an active account. *Under Buzzme’s 3rd Anniversary flash sales promo, customers who subscribe to a Smarter Bundle before 30 September 2016 will enjoy up to 1.5GB of extra data. Depending on customer feedback, Buzzme has revealed that this promotion may soon be made into a permanent offer. Today’s consumers care more about data than voice minutes or SMS. To meet customer’s needs, Buzzme has a range of Smart Surf data plans available, ranging from Smart Surf 200MB at RM5, 1GB at RM25, 3GB at RM60, 5GB at RM95, to Smart Surf 8GB at RM135. Customers who subscribe to the Smart Surf 1GB plan will also earn 5 reward points, while Smart Surf 3GB will grant 15 reward points. 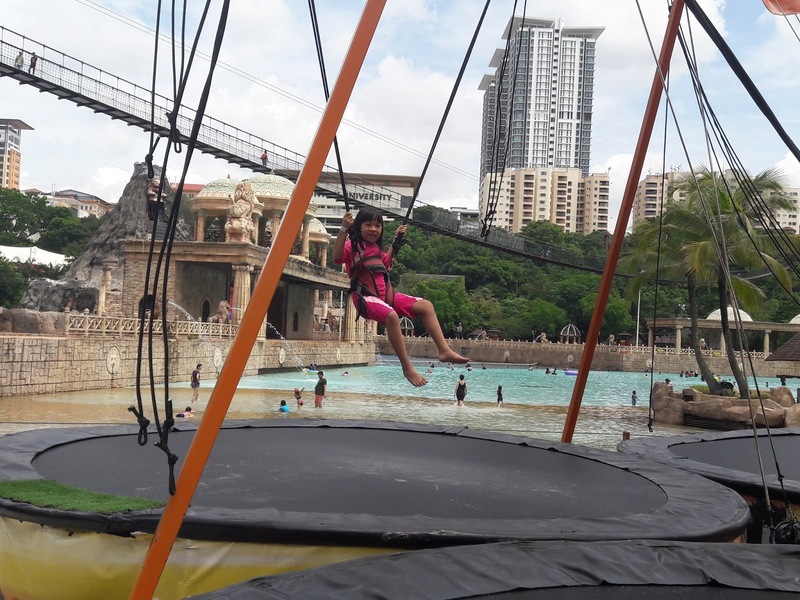 Since reward points can be exchanged for credit on a 1 point equivalent to RM1 basis, customers get to enjoy 1GB and 3GB data at only RM20 and RM45 respectively. Similar to Smarter Bundles, all Smart Surf plans come with unlimited validity, meaning subscribers will never waste any of the data that they have purchased. For customers who require mobile service but do not wish to top up RM30 every month just to maintain an active number, Buzzme offers an attractive solution. Called Smart Validity, it allows subscribers to enjoy 365 days of validity by paying a one-time fee of RM38. That means that customers will only have to reload when their credit is running low. 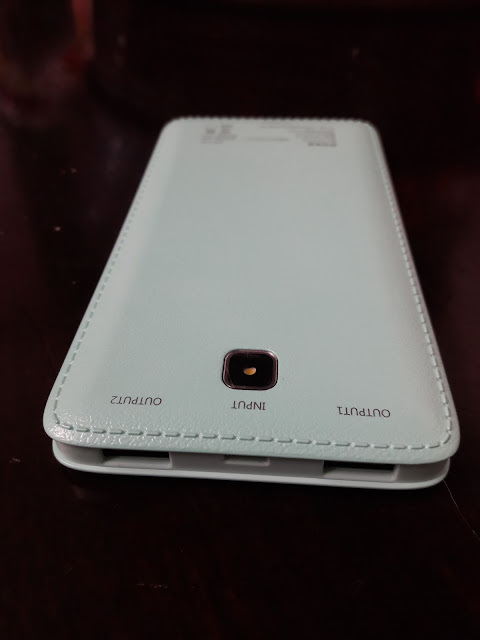 This is especially useful for customers who only use a mobile phone to keep in touch occasionally, such as grandparents or people who usually only receive calls. The 3 lucky draw winners of smartphones. 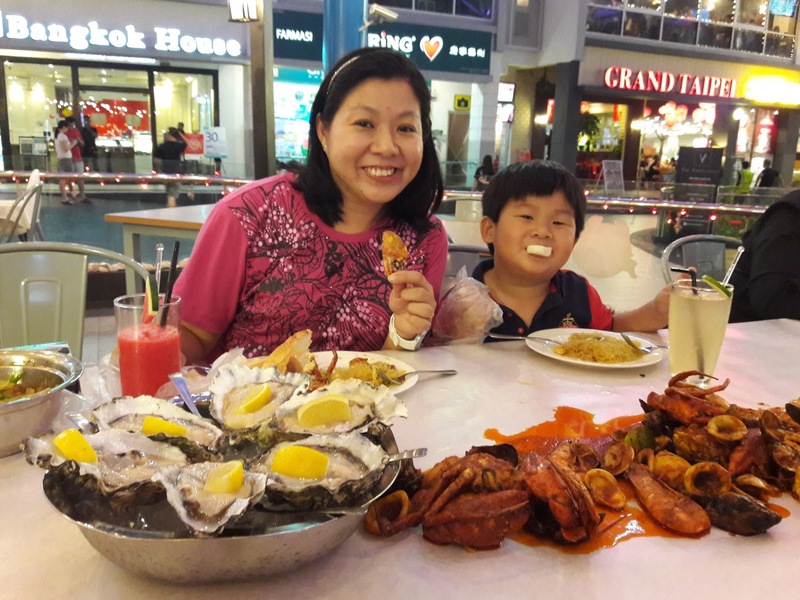 I love to eat seafood and crab is my favorite. I was at Just Seafood restaurant at Sunway Giza Mall last week and had the tastiest and freshest seafood with 3 delicious sauces. I will definitely come back for more. 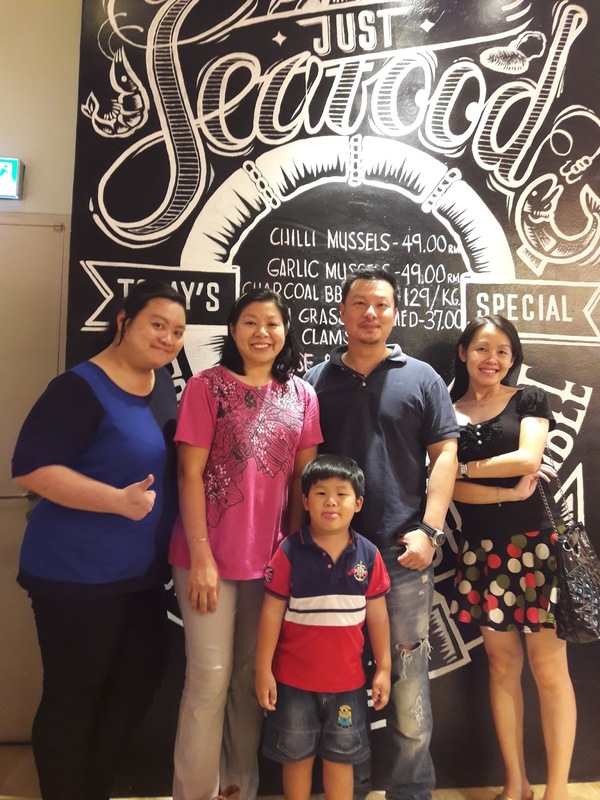 Just Seafood was established in 2014 and serves the best of seafood from crabs and prawns to oysters and mussels. 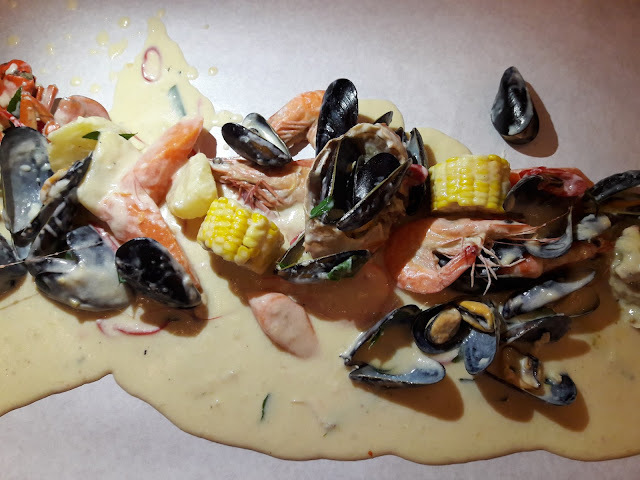 Just seafood pioneered a new way for Malaysians to savour the seafood dishes at its freshest served on-table style in three sauces - Louisiana Cajun, Butter Milk, and Creamy Peanut. 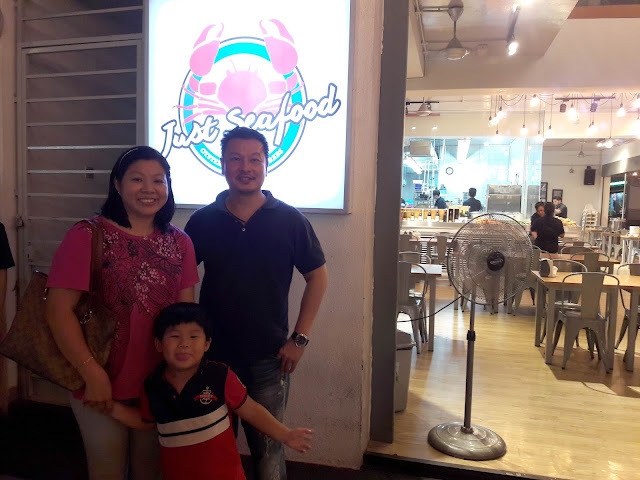 Terence Ham, the founder of Just Seafood with my son and me. Just Seafood has set meals catered for 1-2 pax, 3-4 pax, and 5-7 pax. 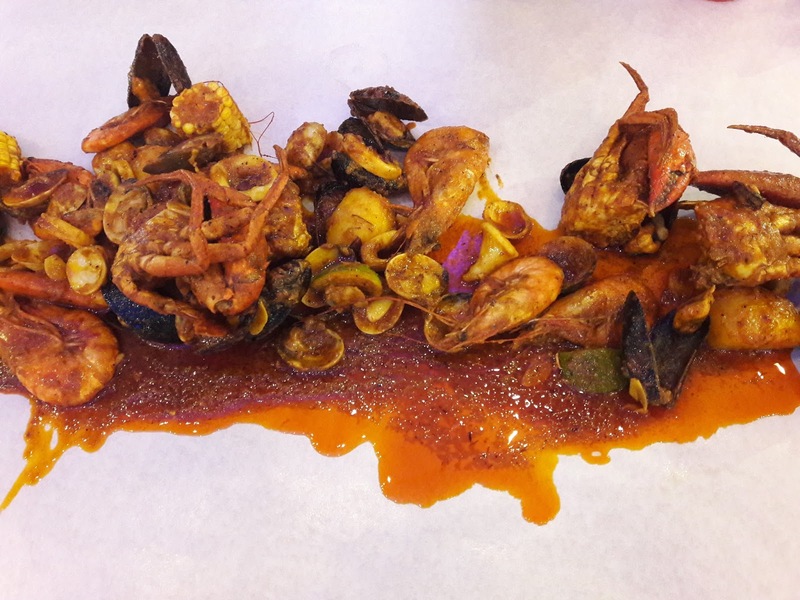 A typical set includes meaty crabs, giant prawns, extra large prawns, large clams, Chilean mussels, squid, potatoes, carrots, corn, and rice or toasted bread. The live oysters are imported from USA. RM 18.00 each. If you buy 4 pieces, you get 1 free, 7 pieces, get 2 free and 12 pieces, get 4 free. 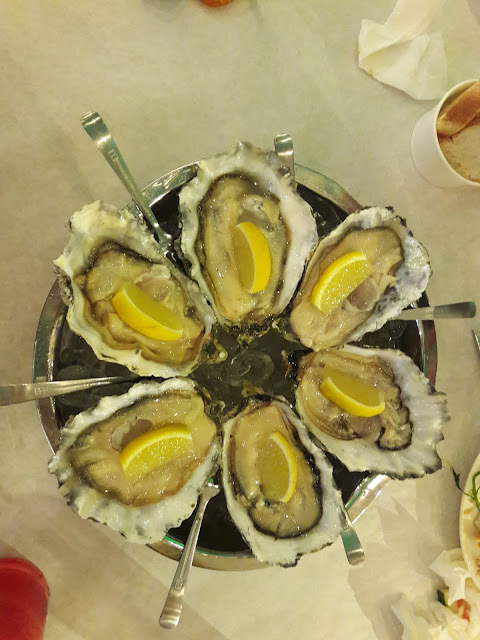 The live oysters are very fresh and big. For oyster lovers, one is not enough. We used our hands to eat instead of cutleries and tableware because Terence wants patrons to really focus on the food and have a good time in a relaxed and casual atmosphere. The restaurant provides plastic gloves too if you do not want your hands to be dirty. Louisiana Cajun style sauce inspired from flavors from USA was made popular by the Vietnamese in Louisiana. Terence and his chef who is a Vietnamese perfected their version of the Louisiana Cajun sauce which has just the right amount of thickness. This sauce is a little spicy and sour. Currently this is the best selling sauce and also my favorite. The Buttermilk sauce was my son's favorite. 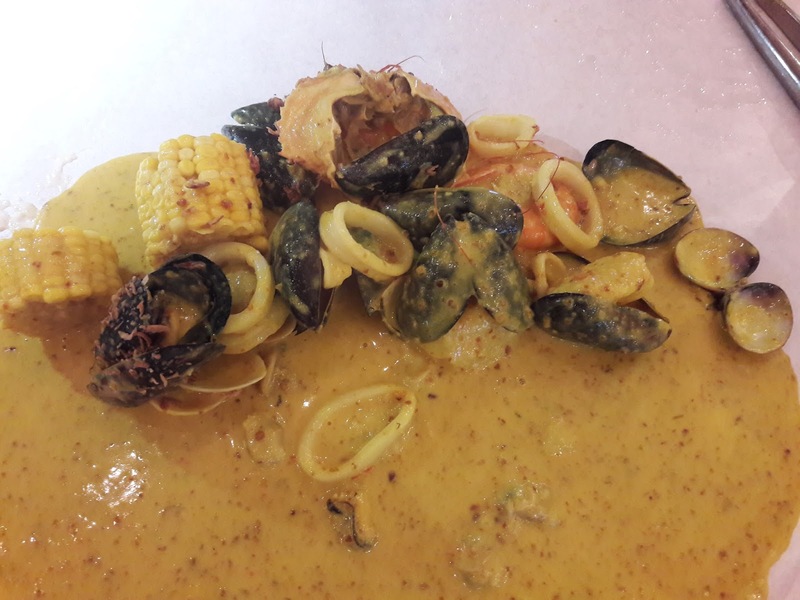 Just Seafood spares no expense when it comes to their ingredients - a whole bottle of buttermilk is whisked into its special blend and its flavor is also enhanced with freshly plucked curry leaves. This is also very well received. The Creamy Peanut sauce is inspired by Malaysian's favorite satay dish that comes with the spicy peanut sauce. However, Just Seafood's peanut sauce has been reinvented to blend with seafood so you can expect the aromatic nutty taste while savouring the soft creamy notes with just the right hint of heat. This sauce was voted as the best sauce in Australia according to Terence. 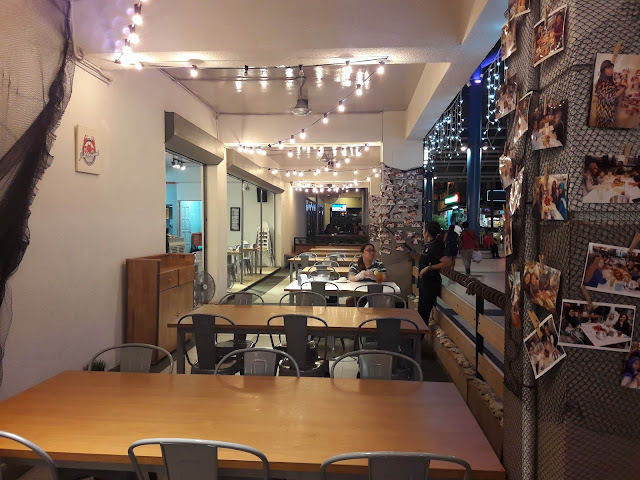 This restaurant is completely pork free and has an open kitchen concept so the cooking process is transparent and good hygiene is a priority. 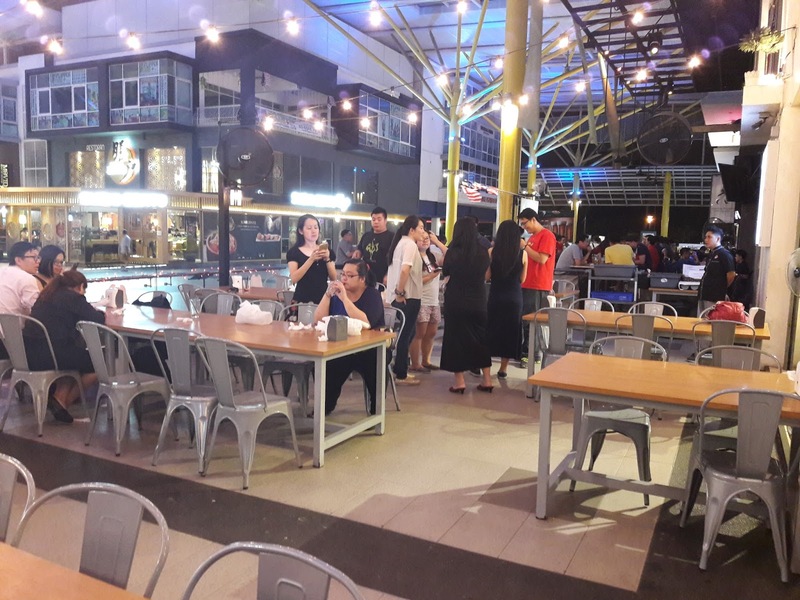 The 2 storey outlet offers its patrons various seating options indoors and alfresco for patrons to fully enjoy their meals. 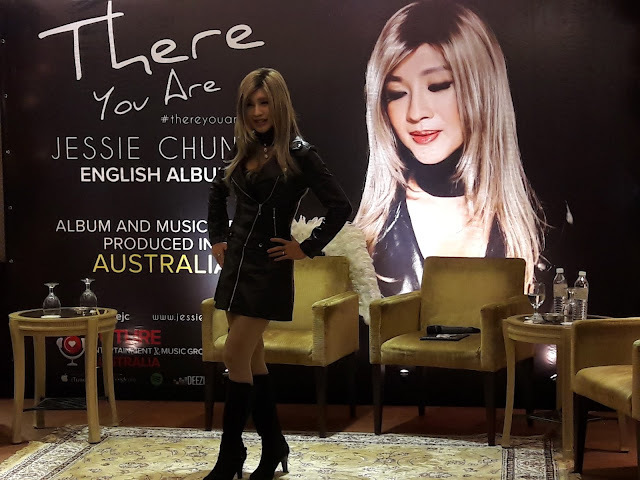 I was invited to the launch of Dr. Jessie Chung's fist English EP "There You Are". Dr. Jessie Chung has a new look with her blond hair without fringe. I think she looks prettier now. Dr Jessie Chung, a Sarawak-born international singer, actress, and entrepreneur, launched her first English EP ‘There You Are’ recently. She has already taken on the Chinese market with great success. Spreading her wings further, this EP will be Dr Jessie’s launch pad for entry into the English market. 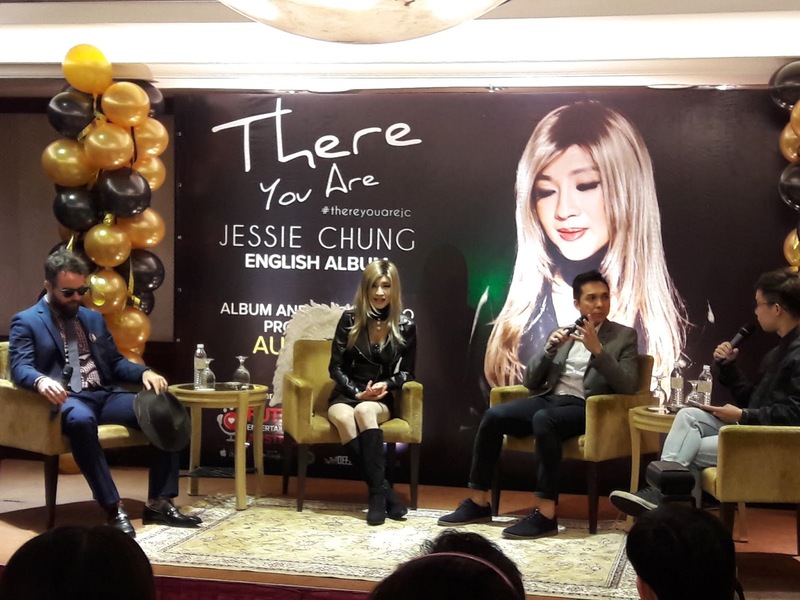 Dr Jessie Chung’s EP will feature three songs “There You Are”, “Drive My Heart” and “Someplace Honest”. “There You Are” can be purchased digitally on iTunes and KK Box, and the album will be available in all NHF outlets nationwide. Get a copy of the EP today or download from iTunes. Her songs are really great, you should get a copy too. 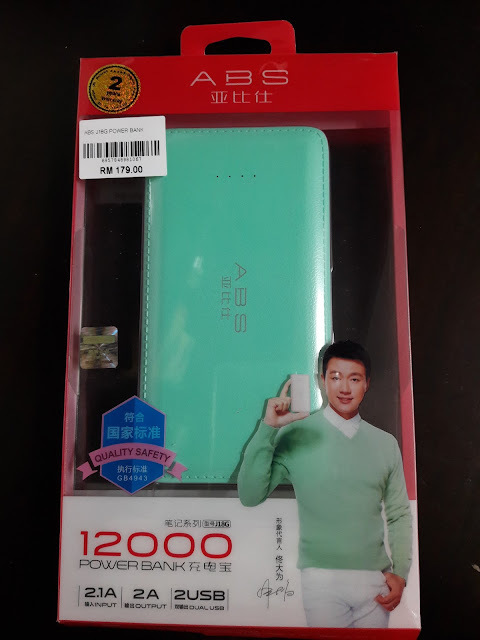 I received this ABS Power Bank, model J18G, 12000 mAh for review. I was really happy to get this as my phone battery runs low whenever I forget to charge it. This ABS Power Bank has a 2 years 1 to 1 exchange warranty. It is light and compact, very stylish and looks like it is wrapped with leather. It comes with 4 LED light indicator on the front and a camera like LED flashlight on the back. There is a button on the side and when pressed for a long time, it turns on / off the flashlight. This ABS Power Bank has dual output fast charging. 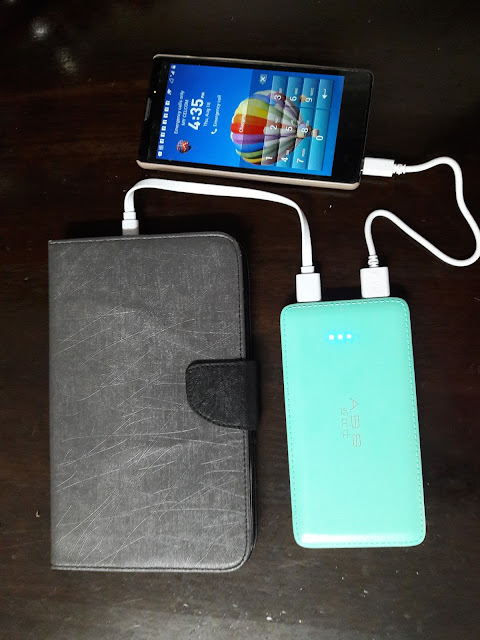 When my mobile phone was out of battery, I used this ABS Power Bank and it took about 1.5 to 2 hours to fully charge my smartphone with 3300 mAh battery. 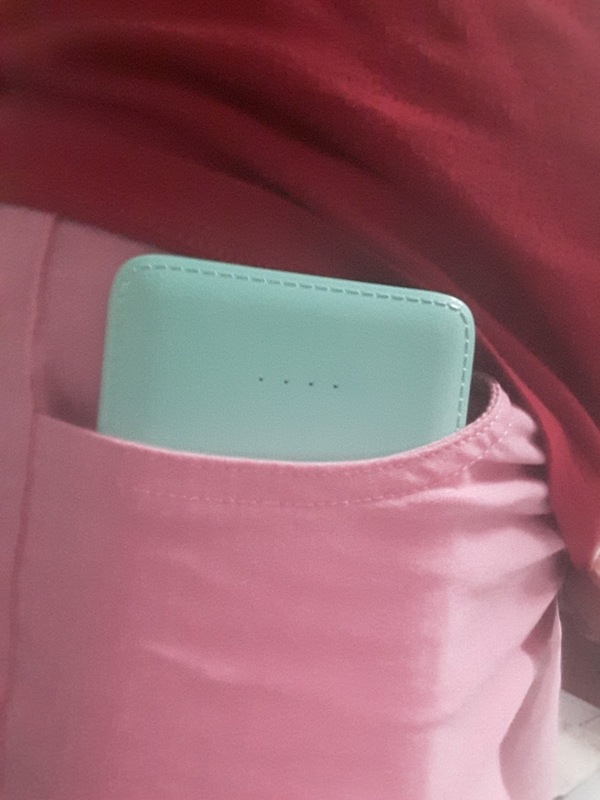 It can charge up to 2.5 times of my smartphone when it is fully charged. 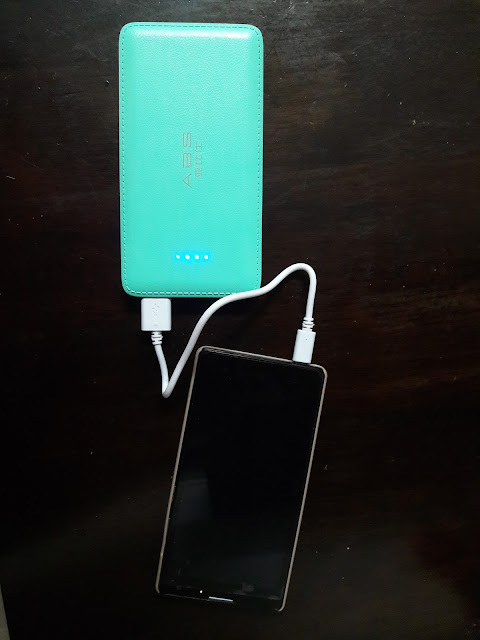 When I am outside and when there are 2 devices that need to use the power bank, I can charge both at the same time. It is so compact and light that I can slip it into my pants pocket or handbag easily. It is really convenient to bring it with me wherever I go. Distributor : C Two Gadget Sdn. Bhd. You can get this power bank at 11th Street Online as they are having Merdeka Sales with 20% - 30% discount until 31st August 2016. The phrase "Mak Kata" which means Mom Says was first used in a classic Dutch Lady commercial in 1983 featuring 2 boys quoting their mom's pearls of wisdom. 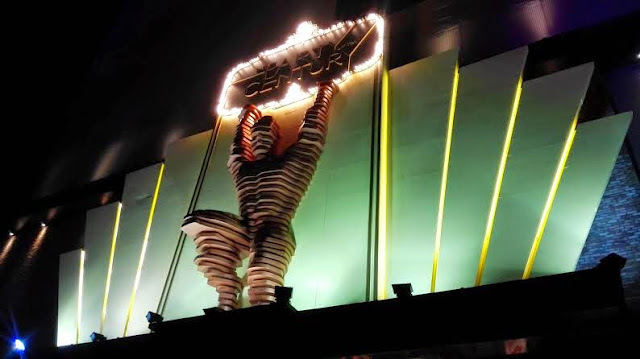 Inspired by this, Dutch Lady introduced the "Mak Kata" campaign in 2014. Now, Dutch Lady is pleased to bring back this campaign to reflect the smartness of kids these days. 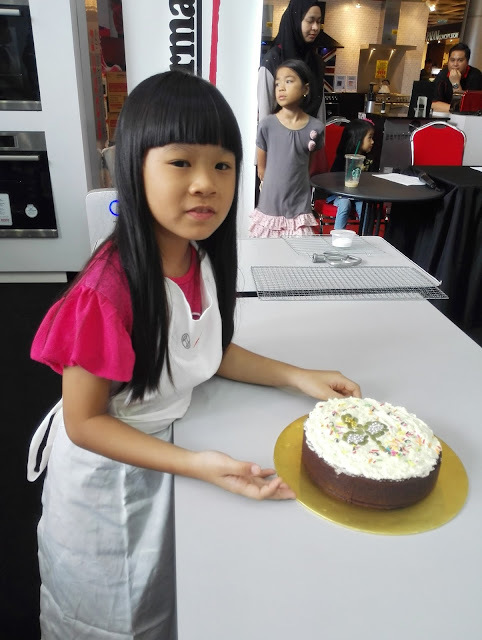 The "Mak Kata, Saya Anak Bijak" contest is the perfect platform for mothers to share funny, touching or interesting snippets from their daily lives that are related to their child's quick thinking and smart imaginations. All moms with children age 1 years old and above are invited to join this "Mak Kata, Saya Anak Bijak" Dutch Lady contest. 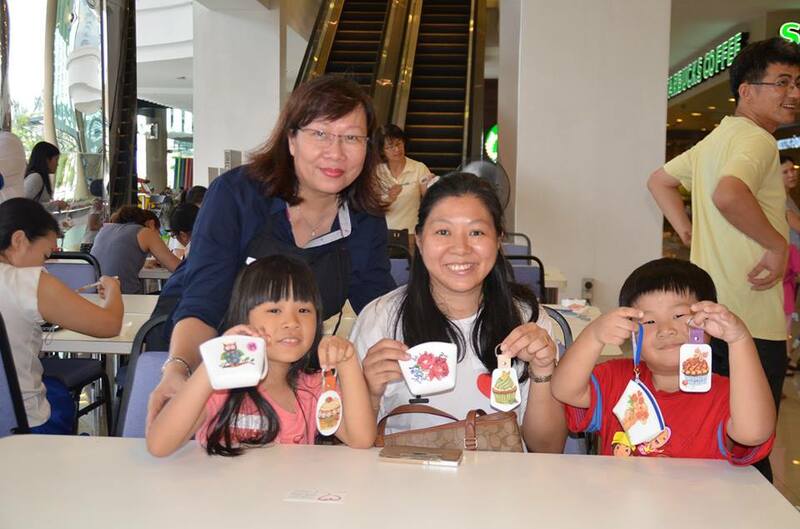 The 9 lucky winners and their family members will spend a lovely afternoon tea party with celebrity mom, Scha Alyahya and her daughter Lara Alana and receive 1 instant camera to capture their happy times together. On top of that, the first 250 weekly submissions will receive RM 50 cash prizes each from 1st August - 30th September 2016. Are all moms out there excited about this contest? Come and join now. To join this contest, you need to follow the 4 simple steps below. 3. 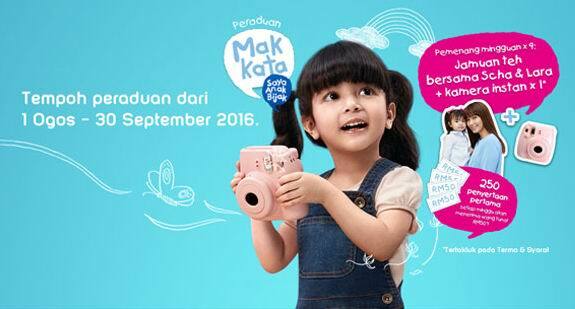 Enter your favorite "Mak Kata" quote and upload a photo of your child age 1 years old and above. 4. Click 'Submit' and keep your receipt. 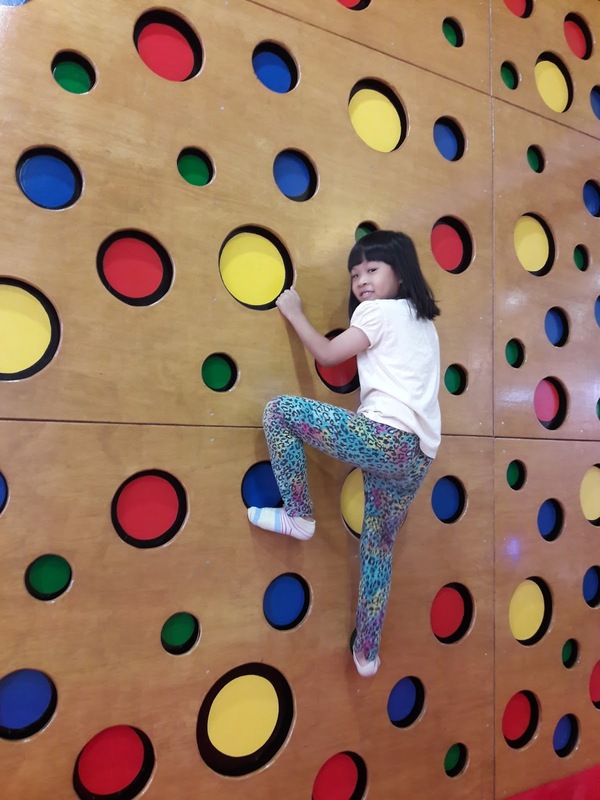 When I was a small girl, my mom said "You not only need to study hard, but also get involved in sports and other creative activities, always think out of the box to succeed." I was a smart and hardworking girl, I made my parents proud by getting the 1st position in the whole of St. Mary's KL primary school in standard 5 when I was 11 years old. Sometimes I was in the 2nd or 3rd place. I was different from other students as I started learning Bahasa Malaysia only when I was 10 years old in standard 4. I had my earlier education in USA. I traveled to many countries with my family when I was young. 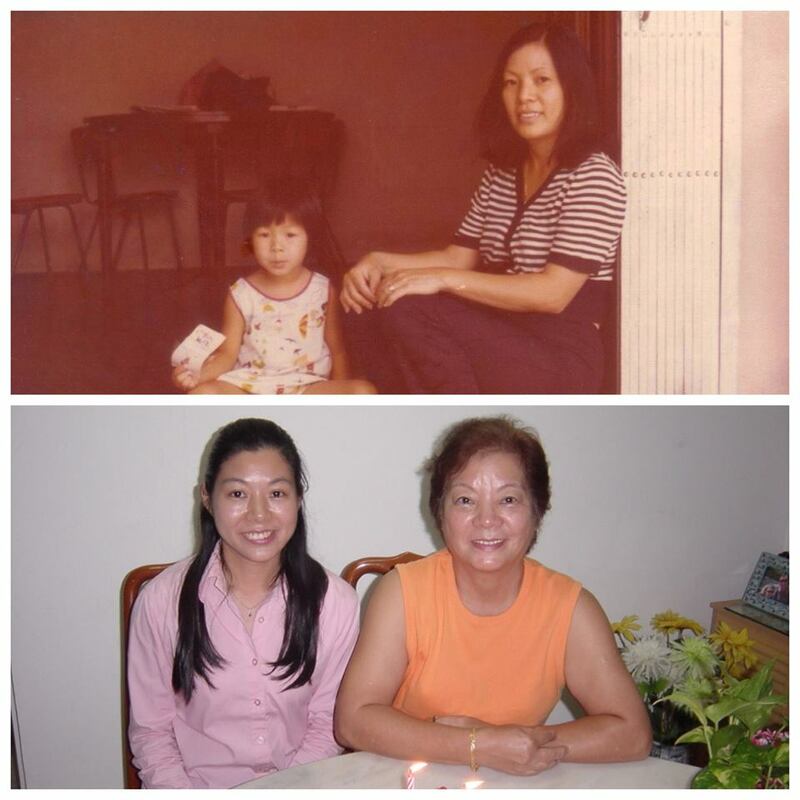 I took my mom's advice to be active in sports, played badminton, skating, swimming and table tennis. I also took up organ lessons and really loved music. Whenever I faced problems, I would think out of the box and do things differently. I graduated as an Electrical Engineer when I was 22 and received my professional IR. title from the Board of Engineers, Malaysia when I was 27 years old. Now I am a mom myself and have 2 children. My daughter is a dyslexic child. Dyslexia comes from the Greek language, 'Dys' means difficulty while 'Lexia' means written words. So dyslexia is a word describing some people (5-10%) who find it hard to learn to read and write even though their intelligence level is normal. When I first learnt of her handicap 2 years ago, I was sad but now that I have found out more about dyslexia, I know some dyslexics are very bright. Albert Einstein, Alexander Graham Bell, Walt Disney, Whoopi Goldberg, Lee Kuan Yew, Steven Spielberg, Leonardo Da Vinci, Steve Jobs and Cher are some examples of famous dyslexics. Some of these dyslexic people are very smart because they can think out of the box. My advice to my daughter is "Don't compare yourself with others, be creative, do what you do best and you will succeed. You do not need to be the best, you just need to do your best." I have tried to get my daughter involved in arts, handicraft and sports so that she can enjoy life and not worry too much about examination results. I have a younger son who is very cute, active and strong. 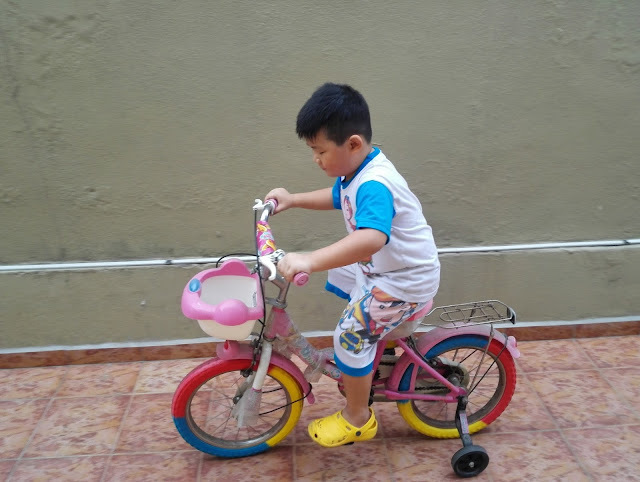 He loves to dance and ride his bicycle. He still has not started school yet but he is drinking Dutch Lady Nutri Plan milk. I hope he will grow up to be strong and healthy. 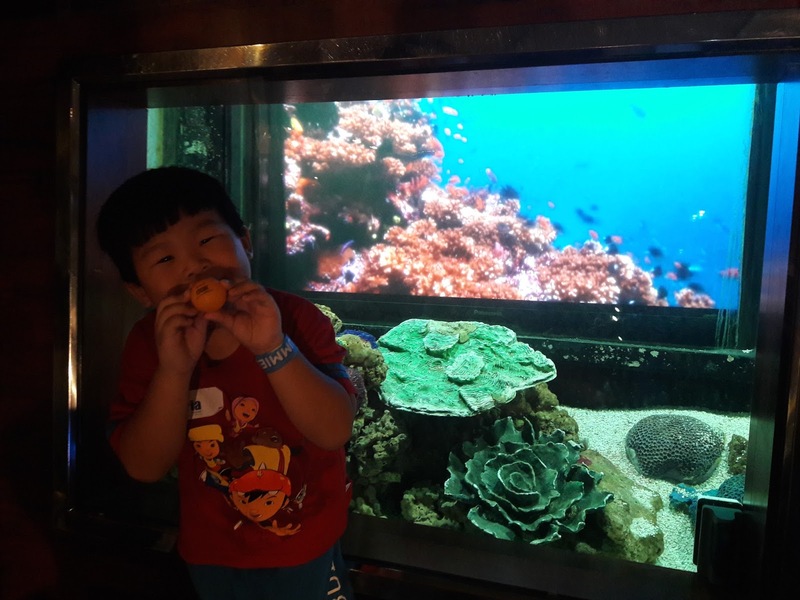 These are some photos of my children enjoying different activities. My children taking swimming lessons. This is Mirabelle Decoupage art. To read more about it, visit my daughter's blog HERE. Daughter learnt to bake and decorate a chocolate cake. 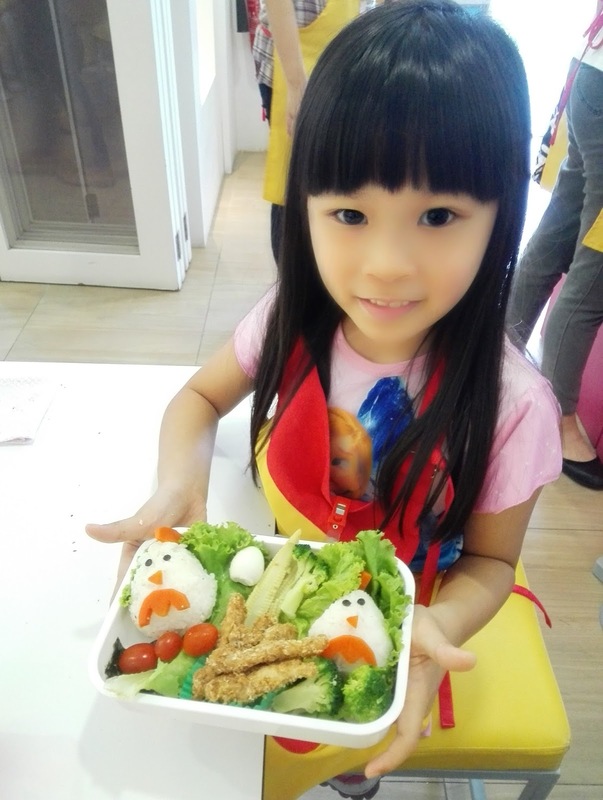 My daughter's creative food art. Lovely Hello Kitty handicraft work. As children grow, their ability to learn develops. 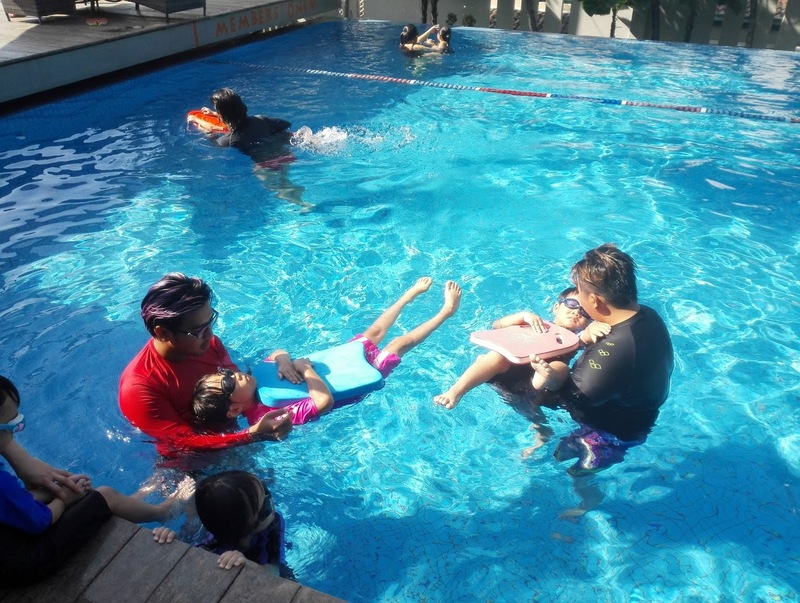 Their curiosity, creativity and imagination to explore widens. 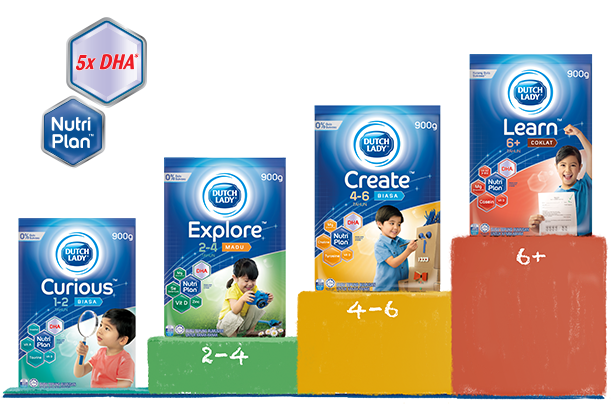 The Dutch Lady Nutri Plan with 5X DHA is able to provide tailored nutrition to support the different milestones of development from 1 to 6+ years of age. That's why Scha Alyahya gives her daughter Lara Alana Dutch Lady milk powder and say that Dutch Lady Nutri Plan with 5X DHA helps support Lara's each developmental milestones, allowing her to focus on guiding Lara. Children who drink Dutch Lady Nutri Plan with 5X DHA will naturally become stronger and healthier. When children's nutritional needs are well taken care of, moms can focus on guiding them to achieve foundation milestones. I hope all moms out there will give their children this healthy milk powder to drink. Don't forget to join the current contest. Good luck!